A Tom Collins is a drink that is named after the type of glass that it is served in, but it is also named after a famous (at the time) joke. The joke, popularized in the 1870s, involved asking people if they knew a “Tom Collins” or knew where “Tom Collins” might be. 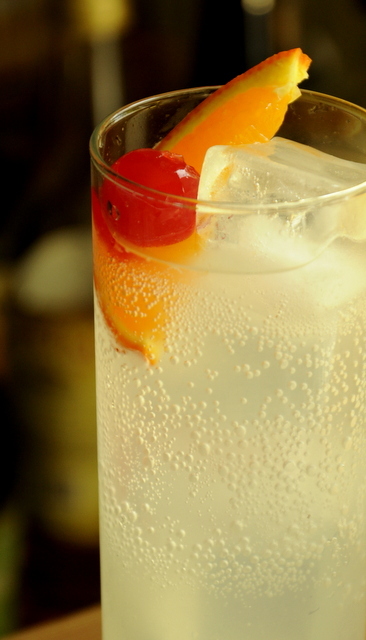 There was no person Tom Collins – but the speaker would carry on the joke by saying he was “just around the corner” or “in a [nearby] bar.” Since the first Tom Collins recipes appeared around the same time, the name of this classic drink is often attributed back to that joke. The joke doesn’t seem as funny these days, but the gin drink that was named after it certainly never goes out of style. Pour gin, lemon juice, and simple syrup into an ice filled shaker. Shake and strain into an ice filled Collins glass. Top with soda water. Garnish with a slice of orange and a cherry.